Paris, Musée du Louvre, from 29 March to 25 June 2012. We generally think that the world’s greatest masterpieces have all been thoroughly studied, leaving nothing more for us to discover. In fact, this is not true as is masterfully demonstrated by the current exhibition now showing at the Louvre on Leonardo da Vinci’s Saint Anne (ill. 1) whose recent restoration gave rise to considerable controversy in the media. We will not take the time to go over the different documents and various theories supporting the hypothetical explanations of the work’s genesis suggested in the past : these are all presented in the catalogue. Our article will provide the principal conclusions put forth by Vincent Delieuvin, the exhibition curator. 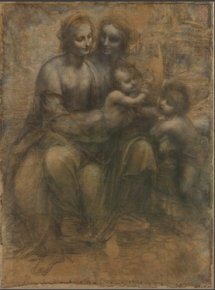 There is no patron known to have commissioned the work and it seems probable that there actually never was one, Leonardo having likely decided to paint it on his own initiative. We know that he worked on it starting at least in April 1501, corresponding to the date when a cartoon is directly documented as existing in Florence. Vincent Delieuvin thinks, in a very well argumented and convincing manner, that the London cartoon (which the exhibition enables visitors to admire alongside the Louvre painting, for the first time no doubt) constitutes in reality a preliminary project executed around 1500 after Leonardo returned to Florence but which was finally abandoned (ill. 2). There were three cartoons in all, the second being the one documented in April 1501, in reverse order to the first, and whose production can be deducted thanks to several clues, from a description given by Fra Pietro da Novellara who knew of it directly as well as from the existence of preparatory drawings or even two supposed copies, one by Brescianino (ill. 3), displayed here in the exhibition. A third and last cartoon, from which the final work was painted, is confirmed by an infra-red reflectographic analysis carried out in 2008. The final painting, based on this last cartoon, was started in 1503 and remained unfinished at the time of the artist’s death. Contrary to what was thought just a few years ago, the panel was acquired early on by the French king who purchased it from Salai, a student of Leonardo. Then it disappeared, probably installed in a private chapel inside one of the Val de Loire château, before resurfacing in the 17th century and joining the Louvre’s royal collections. After recalling the importance of the iconographic theme of Saint Anne in Western art, particularly in the 16th century, the exhibition explores the creation of the work in three sections, the same number as the preparatory cartoons. 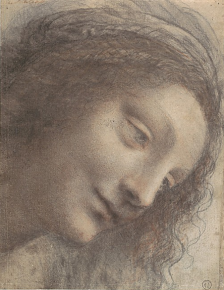 This provides an opportunity, of course, to admire Leonardo’s many preparatory drawings (ill. 4), but also, to discover several copies of either the first cartoon (the one in London) or the second, as well as the different stages of elaboration before the final work was completed based on the third and last cartoon. The students in the workshop, although it is impossible to determine exactly which ones, painted other versions of Saint Anne at the same time as Leonardo was working, each at different points of the process, and at times selecting solutions which were not kept as we can see from the x-rays of the Louvre painting especially. This procedure was not unusual for Leonardo ; the Mona Lisa itself was copied directly at his studio in identical conditions. For instance, the work which was supposedly discovered recently at the Prado (but actually known for a long time) is an example of this. In the course of the restoration for the exhibition, specialists noticed that the background, which had been repainted in black, concealed a landscape of which certain variations correspond to an intermediate stage in the Louvre painting. This discovery which some newspapers (and the Prado itself) attempted to pass off as a major event, is in fact not at all significant, particularly since the copy is not of very good quality. 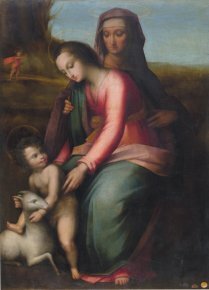 However, one of the studio copies of Saint Anne, held in a Parisian private collection and rediscovered at this time (although published, it had not attracted critics’ attention) is a beautiful revelation (ill. 5). Of note also is another copy belonging to the Armand Hammer museum in Los Angeles. Indeed, we should not exclude the possibility that the master himself might have lent a hand in producing some of these versions being executed by the students under his care, although the technique is very different from his signature sfumato. These two paintings, attesting to intermediate stages, are themselves known through later copies. While the London cartoon is chronologically earlier and could have been placed in the show before, a special space has been reserved so as to juxtapose it to the Louvre painting. We would remind visitors to take the time to walk around the back of the panel for an exceptional look. This is not only to take in the three small sketches recently discovered there by Sylvain Laveissière’s eagle eye (see news item of 18/12/08) but also because we always learn something when looking at the back of a painting . The following section places the work in the context of Leonardo’s remaining career by showing works which are close in style or theme. This is the only part of the exhibition with a hang which is not really clear whereas the demonstration in the catalogue is more convincing. 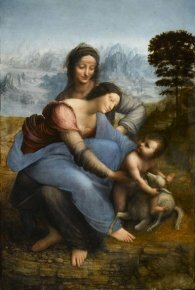 We then leave Leonardo behind in a way as the show goes on to explore the legacy of the painting, both in Florence and the rest of Italy or Europe. 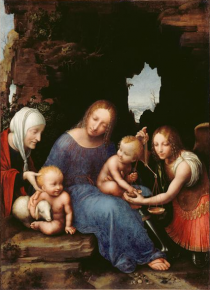 Saint Anne was actually the first pyramid composition, bringing together the Virgin and child with other figures. The works by Raphael and Michelangelo are themselves the result of a model which they wanted to take on, from La Belle Jardinière to the Tondo Pitti, which was able to make the trip from Florence. However, the most interesting aspect lies in fact in the less celebrated pieces which attest to Leonardo’s influence. 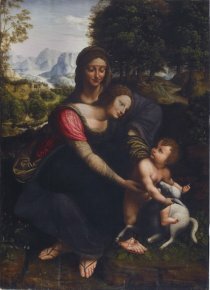 We find examples in northern Italy of course with the very beautiful Louvre painting of an anonymous Lombard painter, the Master of the Virgin with Scales (ill. 6), in Spain as well with with paintings whose attribution still wavers uncertainly between Fernando Llanos or Fernando Yañez de la Almedina, the second having collaborated with Leonardo in The Battle of Anghiari, finally in Flanders with a large altarpiece by Michel Coxcie. The visit concludes with more recent works inspired by Saint Anne. Vasari’s assertions that the work had never been painted, plus the fact that it disappeared for over a century account for its subsequent oblivion. It was only in the second half of the 19th century that artists rediscovered it, for instance Odilon Redon or Degas who left magnificent drawings (the second notably is represented by a sheet from a private collection), as well as Max Ernst with his interpretation of The Kiss in 1927. Freud, who claimed to see a vulture in the composition - eliciting smiles today - will at least have served as a source of inspiration for the Surrealists. Collective work, La Sainte Anne, l’ultime chef-d’oeuvre de Léonard de Vinci, Officina Libraria/Editions du musée du Louvre, 2012, 448 p., 45€. ISBN : 9788889854877. Visitor information : Paris, Musée du Louvre, Hall Napoléon. Tel : +33 (0)1 30 20 53 17. Open every day except Tuesday from 9a.m. to 6 p.m., open evenings on Wednesday and Friday until 10 p.m. Admission : 11€ ; acces with a museum ticket is 14€. As our readers may recall, this was the theme of the recent exhibition at Paris-Tableau.